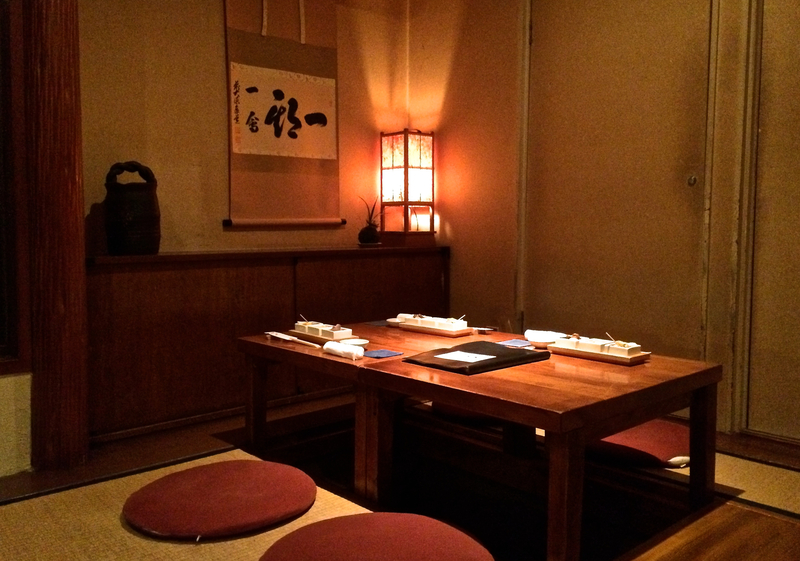 In a city as rapidly changing as Tokyo, it’s a major feat for any restaurant to survive over four decades. 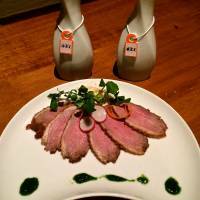 To do so on the edge of Shibuya’s teenage wasteland is even more remarkable. So let’s raise a cup — of premium sake of course — to the one and only Unosato. From the outside, it would be easy to think this venerable, much-loved izakaya tavern must be way past its use-by-date. After all, it certainly looks its age. A bushy stand of bamboo half obscures the entrance, with its glowing andon lamp, long white noren curtain and a curious window display of ceramic sake cups. How can this place still be relevant? Slide open the wooden door and find out for yourself. If you were expecting to find a smoky, moldering last-century backwater, think again. 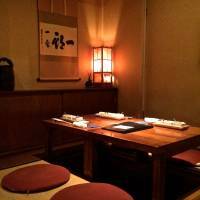 The dining room — split into two sections, with tables and chairs in the front and a tatami-mat area at the back — buzzes with quiet but animated conversation. The demographic encompasses young professionals (both women and men), hip media types and older salarymen who may have been coming here for almost as long as it’s been open. 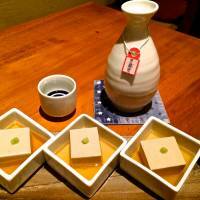 They sip on wine, beer, shochu or chuhai cocktails and, most especially, on sake. Back when jizake (regional sake) was starting to boom in the 1980s, Unosato led the way, and it still boasts an extensive selection. The menu — rendered into English in considerable detail — includes names such as Kokuryu, Tamagawa, Shichida and the wonderful Aramasa (look for the name Amaneko). And just so you don’t forget what you’re drinking, each flask is served with a small tag around the neck indicating the brand. But Unosato’s strongest suit is its food. 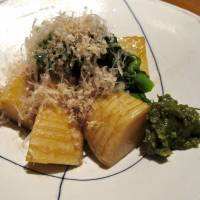 Seafood and seasonal vegetables predominate, just as you’d expect at any izakaya. But here it’s all cooked and served with a little extra attention to quality and presentation. 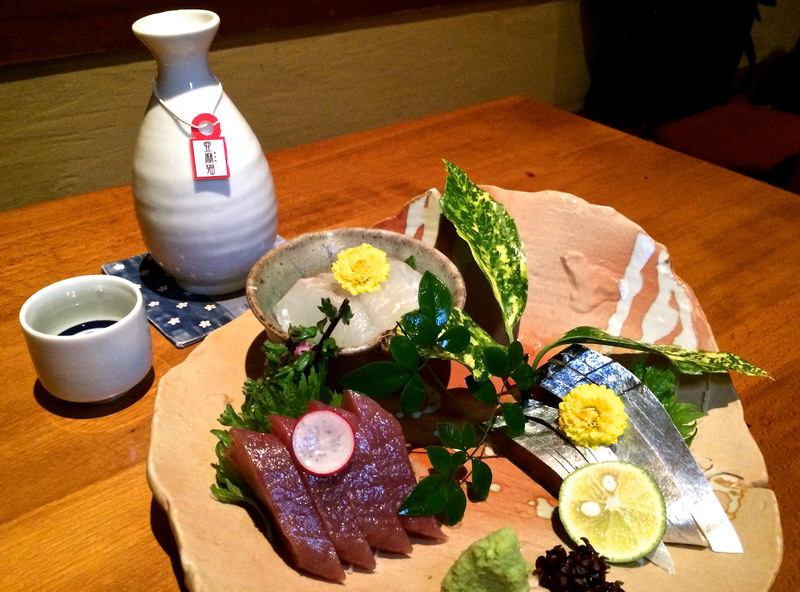 The sashimi is always worth ordering — in fact nothing goes better with sake of this caliber — and there are usually five kinds of fish to choose from, either on their own or as a mixed platter. 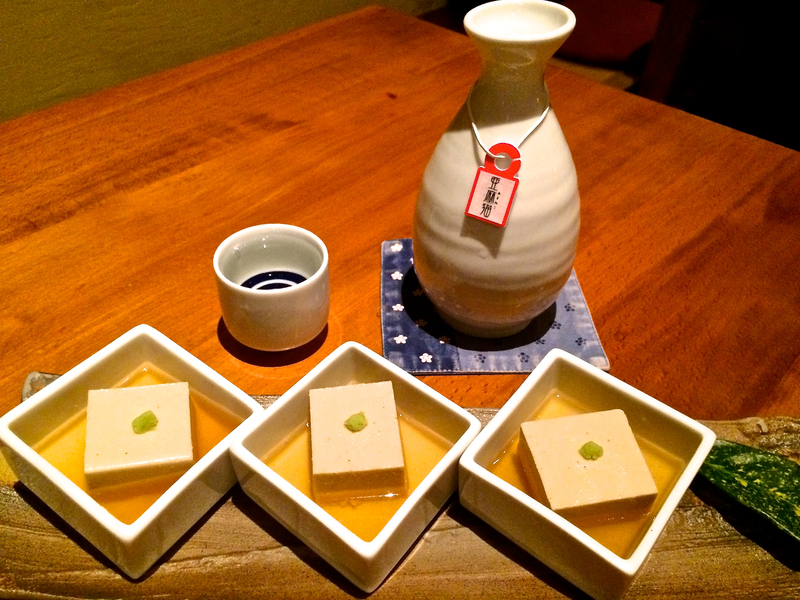 Other great starters include nama-yuba (fresh soymilk skin) and goma-dōfu, cubes of sesame custard resembling tofu. Right now, as spring emerges, this is the time for sansai, the sprouts and buds of wild plants from the uplands. 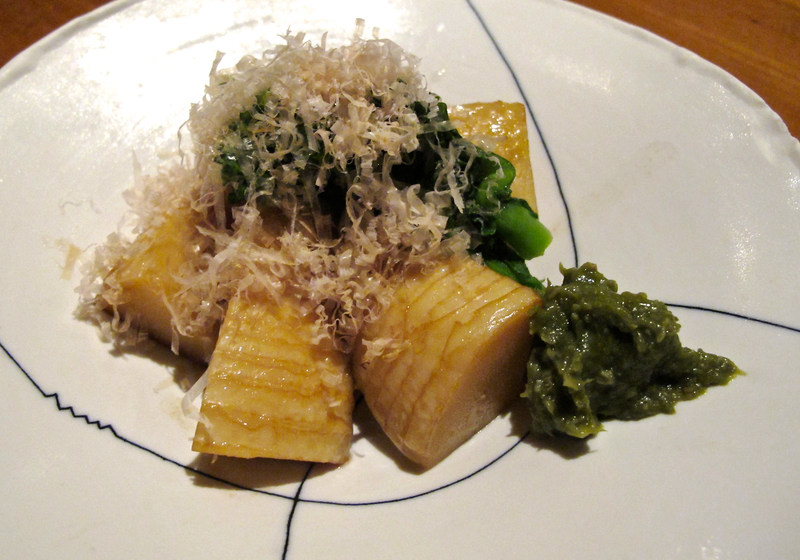 Look for simmered bamboo shoots served with nanohana (flowering brassica greens) and a substantial dab of fuki-miso (an aromatic chutney made from new-season butterbur buds). Another particularly tasty way of eating these harbingers of spring is as tempura. Unosato serves a great combination of three wild buds, taranome (angelica tree), tsubomina (a brassica) and fukinoto (butterbur), with a refreshingly sharp bitterness that rouses your palate and reminds you that winter is finally over. Another longtime favorite is lotus root stuffed with shrimp meat and deep-fried. Side dishes range from the exotic — fermented sea pineapple guts, anyone? — to the familiar and comforting. There are salads and even a mixed cheese plate if you’re ordering wine. And when you are done with the drinking, you can round off the evening with noodles or stone-pot bibimbap rice. It’s a winning combination: a kitchen crew who know all the standards and a youthful floor staff who are friendly and helpful. 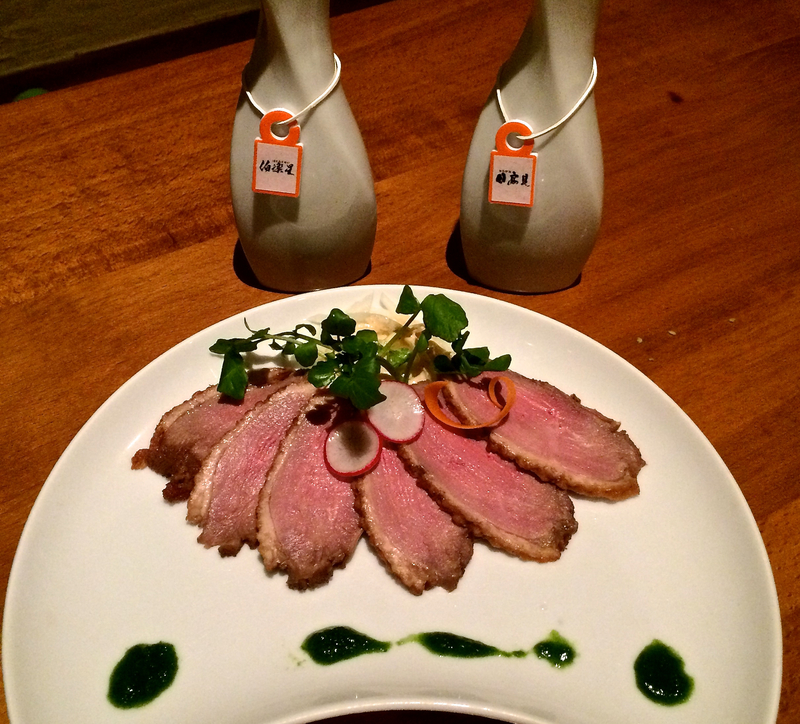 Unosato’s values may be at odds with the brash, modern consumer ethics of its new neighbors, but long may it continue.